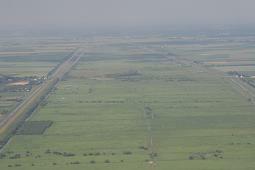 Welney is both a small village and a civil parish in the south-west corner of the county of Norfolk, adjacent to the border with the county of Cambridgeshire, in a region of eastern England known as East Anglia. We are in the centre of the small spot on the right of the outline map of the UK (right). 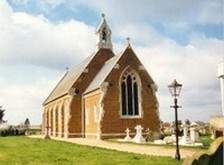 In a wider sense, Welney is also a community encompassing properties and areas in other parishes, other counties. This website is for that community, and for our friends, relatives and "ex-pats" all over the world. The site is independently managed, privately financed and totally impartial, being free of control or influence by local authority, commercial or ecclesiastical sources. It has served the community since 2000. Within the parish there are about 210 dwellings housing just over 500 people (2001 data). There are three main areas of habitation: in the centre, the small village of Welney; to the north-west, the hamlet of Tipps End; and to the south-east the settlements at Suspension Bridge and Gold Hill, plus a straggle of houses spread out northeast along the Hundred Foot Bank. If we include adjoining areas which this website covers, we could add perhaps 30 to 40 properties, say another 70 people. We have a church, primary school, pub and restaurant, parish hall, playing field with sports pavilion, and a retirement home. Like many rural communities we have lost several local services in recent years. Our post office and shop closed in June 2007, but postal services are available for an hour or so daily from a mobile post office and local shops are nearby in the villages of Upwell and Manea, and many more shops and a supermarket in the small town of Littleport. We are surrounded by the small market towns of Wisbech, Downham Market, Chatteris and March, and the catherdal city of Ely. 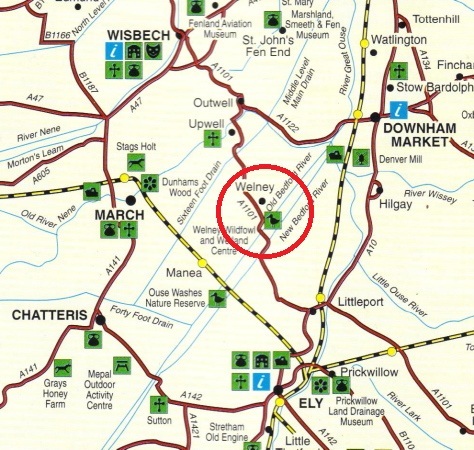 Once, Welney was part of the parish of Upwell. 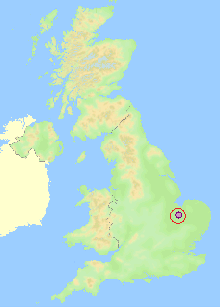 It was also partly in the county of Norfolk and partly in Cambridgeshire. 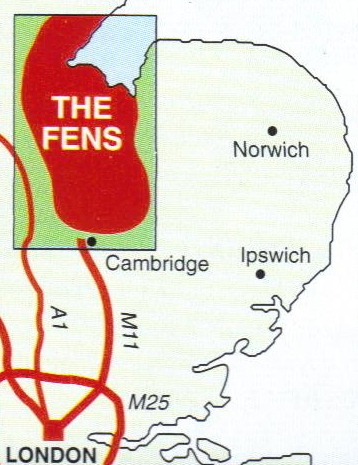 And for many years, the part in Cambridgeshire was actually in the county of the Isle of Ely. OK so far? The eastern part of the parish is separated from the rest by three man-made parallel rivers. 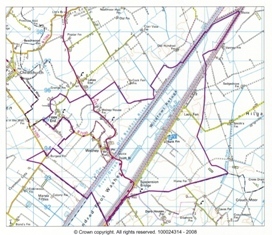 Contained by them is a flood plain, 21 miles long in total, although only a 5 mile section is in Welney. 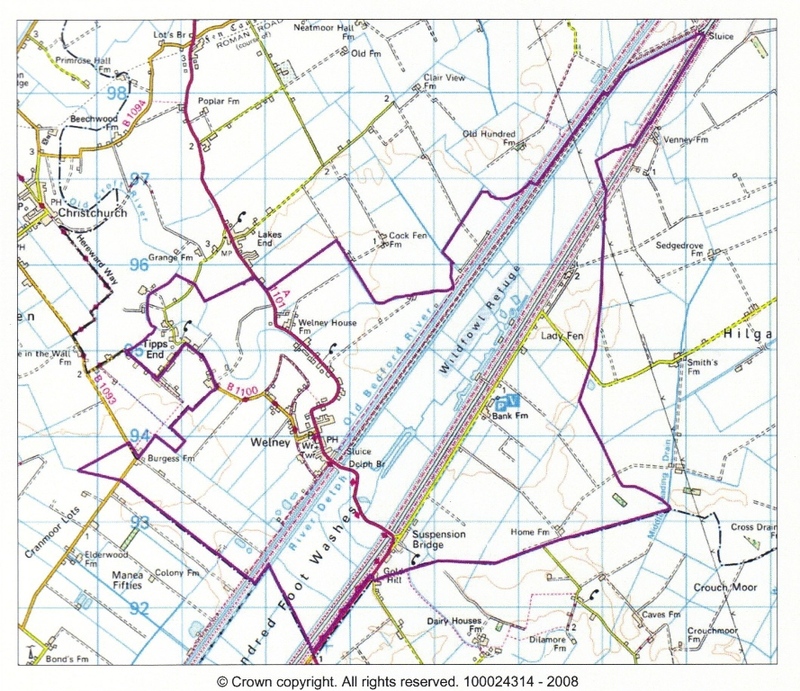 It's the UK's largest floodwater storage area and a designated Site of Special Scientific Interest, known as the "Ouse Washes" but shown on Ordnance Survey maps from their first edition in 1824 to at least 1960 simply as "The Wash" (do not confuse with the great inlet of the sea further north) and on modern ones as "The Hundred Foot Washes". And the part in the parish of Welney is commonly referred to (naturally) as the "Welney Washes". I hope all this isn't washing over you. 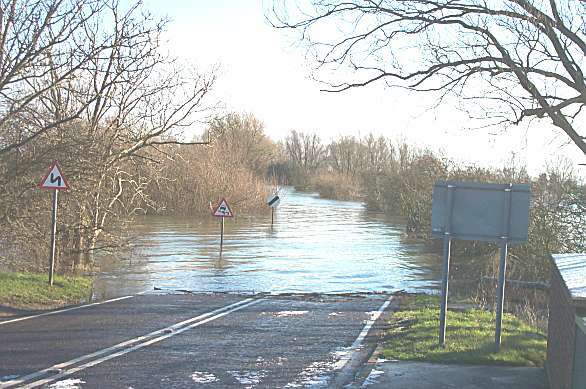 Sometimes the flooding can make travel across the washes on the A1101 main road a little difficult ....... A regular problem for many years. Old Bedford and Delph Rivers side-by-side on left: New Bedford or Hundred Foot River on right; WWT reserve in centre. Suspension Bridge hasn't had, or been, a suspension bridge since 1926, Gold Hill doesn't have gold or a hill; the Hundred Foot Bank is neither 100 feet high, wide or long, and is actually one bank of the New Bedford River otherwise known as the Hundred Foot River, which is tidal, but sometimes called a drain; and the two side-by-side rivers on the west of the washes are known in the south as the Counterdrain and the Old Bedford River, but north of Welches Dam the Old Bedford River becomes the River Delph and the Counterdrain is known as the Old Bedford River. Oh, the Old Bedford/River Delph and New Bedford/Hundred Foot rivers are really just parts of the Great Ouse River. The name of the western hamlet is shown on the road signs and most maps as Tipps End; other maps show Tipp's End or Tips End (and on one early map as Type's End); the Post Office and some locals spell it Tipsend. It is also split administratively - just less than half the houses are in the Norfolk parish of Welney, a couple are in the Norfolk parish of Upwell, and the rest are in the Cambridgeshire parish of Christchurch. All of which makes addresses, directions or historical research a little difficult. 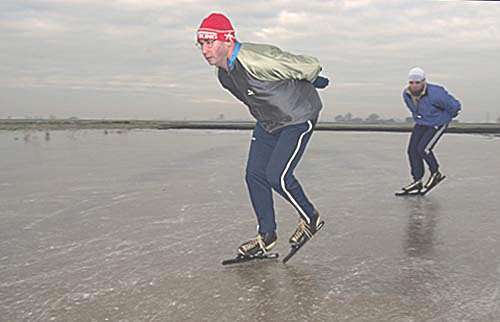 The area was once the centre of ice-skating in England, and Welney had a world champion and several British ones. Sadly, warmer winters make ice a rarity here now, but we still have a skating club. Fishing in the River Delph (right) and the Old Bedford River is fortunately still very popular, attracting anglers from far and wide. 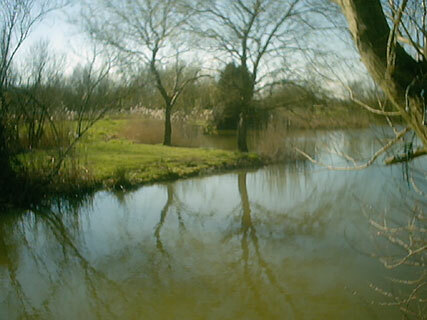 Pike up to 28lbs (13kg), zander, roach, bream, perch and rudd can all be found. Wildfowling, the shooting of ducks, was also once popular and the area supplied vast quantities of ducks for the London markets shot by wildfowlers in punt boats using 8 foot long punt guns. Nowadays the emphasis is on conserving and protecting wildfowl rather than killing them, and most outsiders seem to have heard of Welney because of the swans that visit here every year. 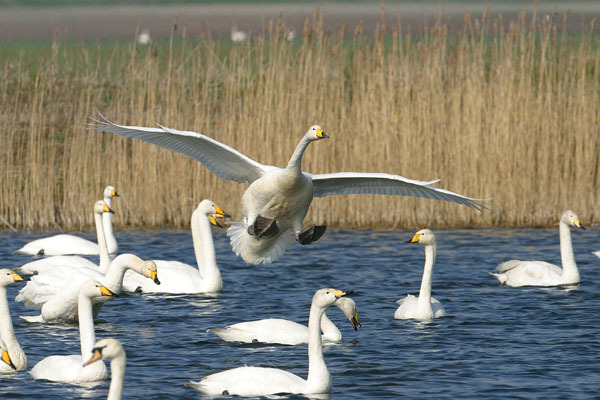 The Wildfowl and Wetlands Trust (WWT) reserve in the Ouse Washes north east of Welney village has been the winter home of thousands of swans and ducks from northern Europe and the Arctic for more than 35 years. Over 8,000 Bewick's and Whooper swans now over-winter here, together with thousands of ducks especially Wigeon, Lapwing, Mallard, Pintail, Pochard and Teal, and wading birds such as Plover. 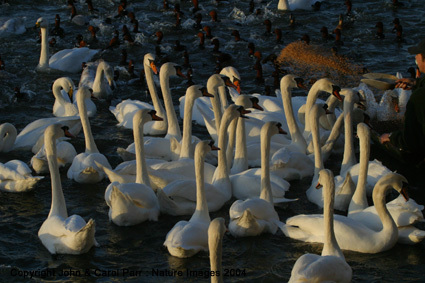 The regular floodlit evening swan feeding (right) is a popular and unforgettable sight. 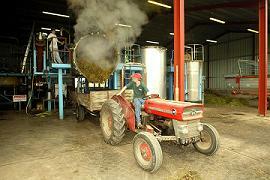 Conservation and the environment are also the themes of other Welney organisations, too. 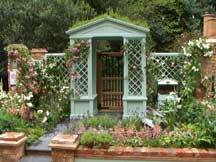 The 2004 garden with lych gate and trellis is on the left, the 2005 one with cedar cabin on right. 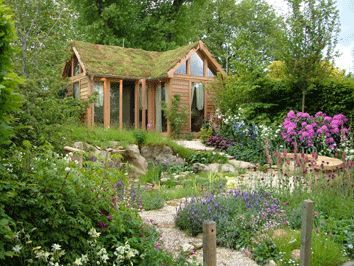 In 2009 they won, at last, a Gold, for their 'Fen Ben' alchemist garden. More about that later! 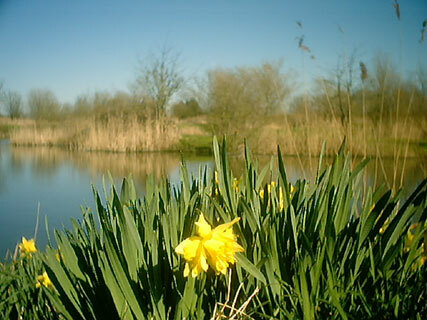 The Pisces Country Park, previously known as Pisces Caravan Park and Fishery, has been awarded three successive annual gold medals since 2003 from the David Bellamy Conservation Organisation for its 22 acre holiday site, now with lakeside lodges available on 50 year leases. 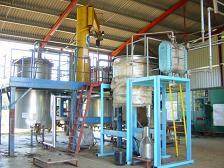 Welney also has what is possibly the largest steam distillation plant of its type in the UK, producing high quality essential oils and floral waters from locally grown aromatic herbs supplied by a number of small farmers who are members of a co-operative. Crops such as chamomile, peppermint, thyme, angelica, and lavender are a welcome change for residents from the traditional - and very muddy - root crops such as potatoes and sugar beet. We also have a village cricket team who were hosts in May 2002 to a first-class county team which included a famous ex-England test fast bowler. 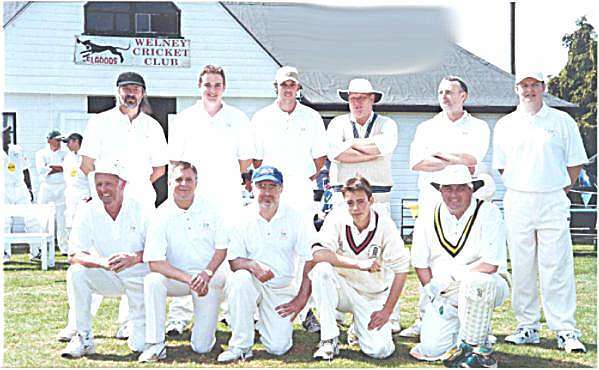 In 2005 two ex-England players made guest appearances for Welney. 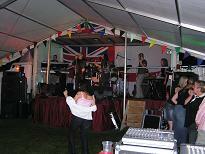 And in August 2004 a small group who first got together just four months previously, put on a Gala and Dance which raised nearly £4,000 for children's play equipment. Not bad for a small fen community! Erected in Main Street just outside the church in 1978, it depicts ice skaters, a windmill draining the land, wildfowl, and the entwined initials 'WM' below the village name. The actions of 'WM' - William Marshall - and also those of the 4th Duke of Bedford and the Dutchman Cornelius Vermuyden, have hugely influenced Welney ever since the middle of the 17th century. On this website, pages that are compliant with modern world-wide-web standards show the new sign, pages awaiting updating have the older one. To learn more of these and many other facets of Welney life from prehistoric times to the present day please take a good look around. The contents page has a detailed site index and search facility. Most pages have links at the bottom to related pages on this or other sites. In all there are well over 200 pages, and hundreds of photos from Victorian times to the present day. During 2013-15, due to other commitmemts, the site only had limited updates and from 2016 it will only be updated to correct any errors, add photos to school and sports pages, to note occasional special events, and maybe to add new Parish Council minutes. But with such a huge content, please contune to visit, there's bound to be more for you to find and enjoy here than you read in one visit. Please note external links will open in a new window or tab. Links were correct in Feb 2016, but are subject to change by the site owners.